Delhi University Teachers’ Association had called for a long march on January 17, from Ramleela Maidan to Parliament street with several demands, including absorption of ad-hoc and temporary teachers into the university through a one-time regulation, resolution of the reservation issue through an ordinance or a bill, and restoration of 200-point roster treating university/college as a unit. More than 5000 people, including teachers, students, and activists participated in the march that started from Zakir Hussain College around 11 am. The march continued to Ramleela Maidan and then to Parliament street, but the protestors were stopped by the police. The police used lathi-charge in an attempt to curb the protest and disperse the crowd, failing which they detained thousands of protestors who were taken to various police stations. Several teachers were injured in the process. On January 8 and 9, the teachers from DU went on strike along with workers from all over the country,against non-implementation of the University Grants Commission (UGC) regulation 2018 and non-involvement of elected members while taking major decisions. 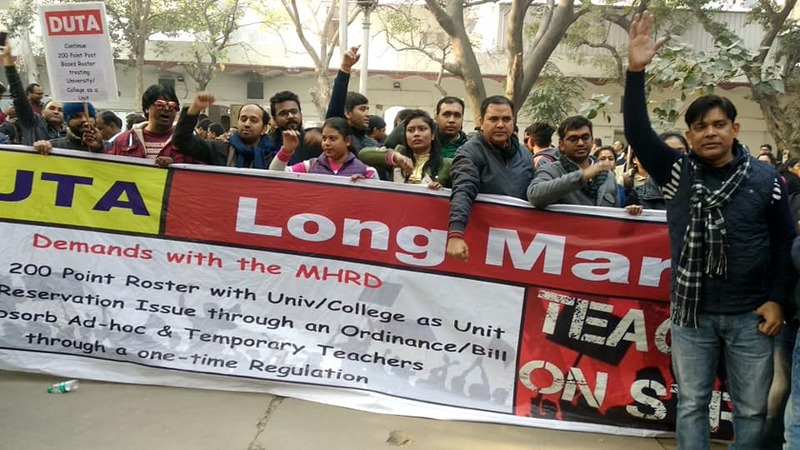 On January 2, professors from across Delhi University held an agitation demanding permanent positions, pensions and maternity leave for AD-HOC teachers. They have organised similar demonstrations and protests earlier too. The professors have alleged that that the entire recruitment process in the University has been put to a halt after a UGC letter dated March 5, 2018, asked the colleges and departments to implement reservation by considering subject as a Unit. They allege that the formula of considering subject as a unit makes it impossible to implement the reservation policy and has brought a significant reduction in number of posts reserved for Scheduled Castes (SC), Scheduled Tribes (ST) and Other Backward Castes (OBC). This is why they have been demanding the restoration of the 200-point roster treating college/university as a unit. Several ad-hoc teachers of Delhi University have been sitting on an indefinite hunger strike since January 4, demanding the same benefits as given to permanent teachers and immediate absorption. Currently, there are 4,600 ad-hoc teachers working in the university. They have all the required qualifications prescribed by the UGC, but are still not being absorbed into the system. The teachers have been fighting a long-drawn battle against the UGC and MHRD for their rights and have resolved to continue their struggle until their demands are met.